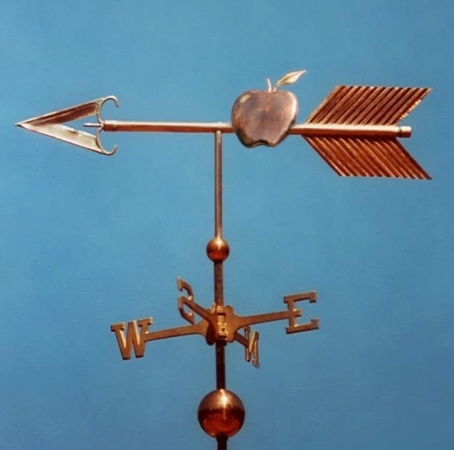 This Arrow Weathervane with Apple and Worm is a whimsical variation on our Arrow with Apple Weathervane design. Both are pictured in the slider above. Affectionately referred to as ‘The Close Call’ by our talented crew, the little worm has just escaped when the apple is struck by the arrow. It is a lovely example of how a simple variation on a design has transformed the meaning of the weathervane. If you have an idea on how to transform this design to give it personal meaning, just give us a call. We always enjoy brainstorming new ideas. 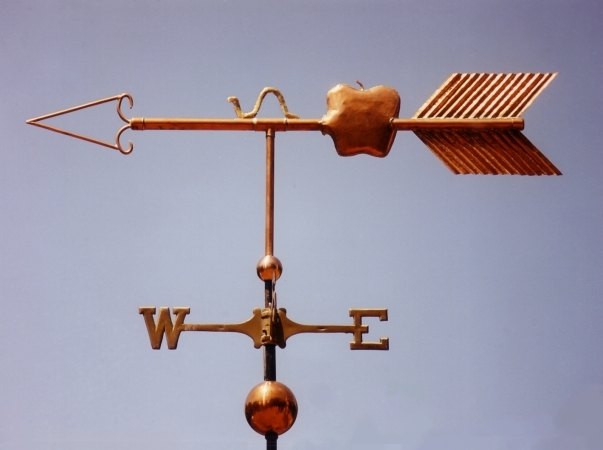 And because every weathervane is made to order at West Coast Weathervanes, personalizations are the creative juice that keeps every weather vane a unique challenge. We have numerous arrow and fletching choices for this swell bodied, copper vane. The arrow rod gives ample room for inscription, and the apple, itself, could be inscribed, or optionally gilded with your family or business name.